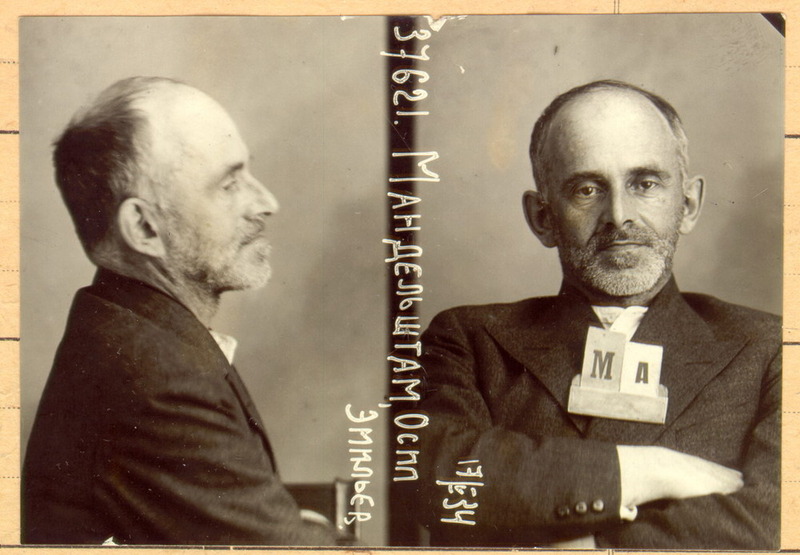 Osip Mandelstam (1891-1938) was born in Warsaw to a wealthy Jewish family that was sufficiently well connected to be allowed residence in St. Petersburg and to enroll young Osip in the elite Tenishev School (in which the very aristocratic Vladimir Nabokov would matriculate a decade later). Like most Russian intellectuals Mandelstam welcomed the Revolution, but earlier than most he distrusted and then despised the Bolsheviks who purged their way to the levers of power. His friend and fellow Acmeist (an "ism" in which the Imagists could have recognized themselves), Nikolay Gumilev, was placed before a firing squad already in 1921, so Mandelstam would have been in trouble even if he didn't openly detest the new regime. His travails in the gulag and in provincial exile are well known due to his wife's, Nadezhda's, famous memoir Hope Against Hope and need not be rehearsed here. and the dead crystal vault of heaven laughing without end! o Freiheit, fern dem Schall. In Celan's book the original is placed en face, so one can see that Mandelstam wrote this poem in two quatrains with rhyme scheme abba. Clearly the Americans have taken much liberty in both respects, while Celan saved more than a hint of the structure, though at the cost of giving the wolves incongruously rolling eyes instead of ferocious ones. The final couplet is pure Celan. Indeed, one sees in Mandelstam's poems relatively little punctuation, but Celan's translations are full of commas, colons and dashes that give the poems a slow, irregular rhythm focusing the reader's attention more fully on the sounds and the cumulative effect characteristic of middle and late period Celan. But my primary purpose here is not to compare the translations, though I do prefer Celan's. And I deliberately distracted you with this comparison using the example of a very minor piece. Enough of that. What about the original work in so far as I can triangulate it behind the screen of different translators and languages? The earliest poems in these collections, written when Mandelstam was 17/18 years old, such as the poem above, are rigorously rhymed, short, distilled and mysterious. But his poetic rhetoric soon expanded to include narrative and personae along with his emotion-laden images, resulting in some strong multiple page poems like "The Horseshoe Finder." He wrote delightful apostrophes to some of his favorite historical figures (like Lamarck) - in which he exercised some of the idiosyncratic ideas I briefly noted in my review of his Journey to Armenia - and moving elegies to disappeared contemporaries (like Andrei Bely). Greco-Roman allusions are made frequently, and all thought is associative. As the reader moves through his work (both volumes present the work chronologically), the increasing weight of despair and outbursts of defiance begin to predominate. As I mentioned in my review of Journey to Armenia, there were times when this weight crushed all the poetry out of him. The wonder is that he was able to find his poetic sources again and again. I'll give Mandelstam the last word, in a poem from 1931 written after one of his stints in the gulag. No, I was no one's contemporary ----ever. That would have been above my station. How I loathe that other with my name. He certainly never was me. to see with, and a splendid mouth of earth. arm of his son, who's already ageing. My eyes were large sleepy apples. of the bloodshot lawsuits of men. getting over its first drunk. how the world creaks on its journey. Well, we can't forge another. We'd better get along with this one. on the curled wafers of horn. 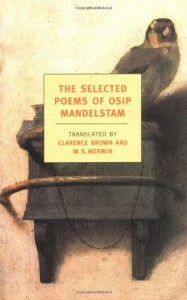 (**) The Selected Poems of Osip Mandelstam (1973). This volume also contains a translation of Mandelstam's essay about the poetics of one of his favorite poets, Dante Alighieri. 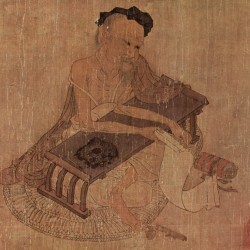 (***) This is one of the reasons why I resolved some time ago to read multiple translations of poetry, when available.